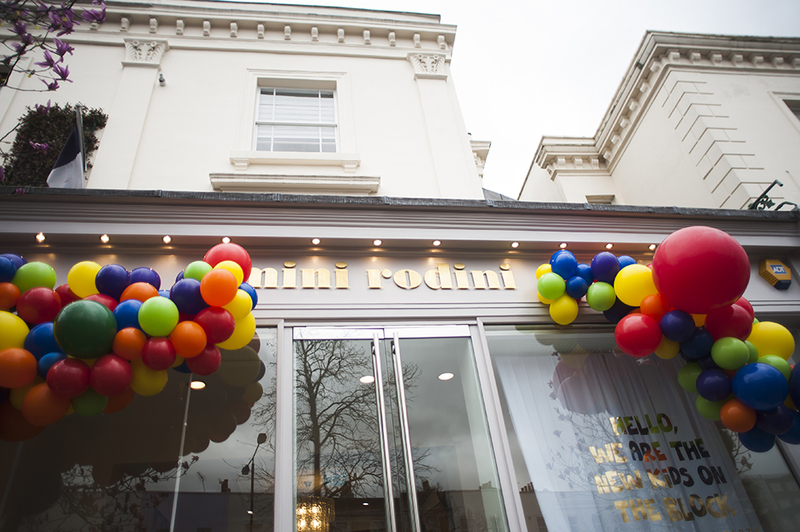 I found out that we had lost our home on the way to the Mini Rodini store launch. And given that I’ve enjoyed almost thirty years of shopping my feelings, I think it’s a testament to my growth as an adult and as a mother that I didn’t blow the entire house deposit there and then. I don’t think that I can bring myself to write about how awful it is to be called three days after a home is sold to you, subject to contract, to be told that the vendor had changed his mind. Needless to say I’ve learnt a valuable lesson about witholding information from the children going forward – Balthazar cried when we told him that we wouldn’t be moving into the house after all and I feel thoroughly culpable. People tell me that this happens, and better now than after paying thousands of pounds in fees for solicitors and surveys. I agree that it could be even worse, but as things stand it is pretty horrible. But that’s not what I wanted to write about today. 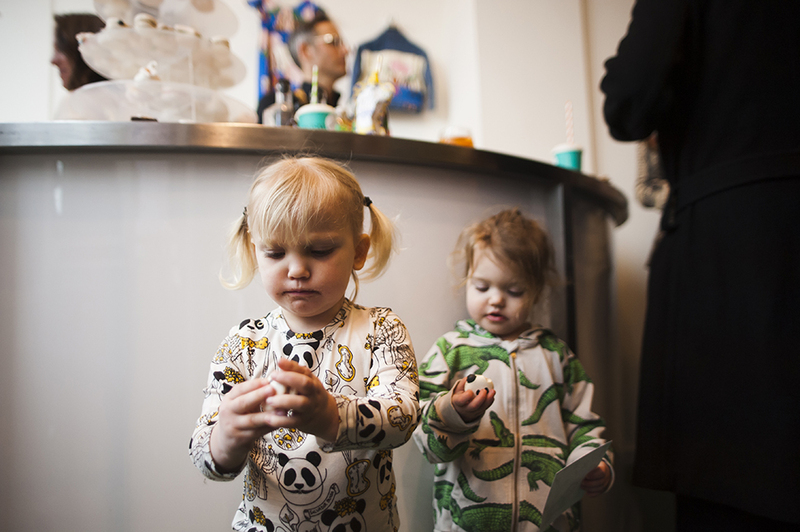 I wanted to share some pictures from the Mini Rodini store opening party, which the girls and I attended on Saturday. 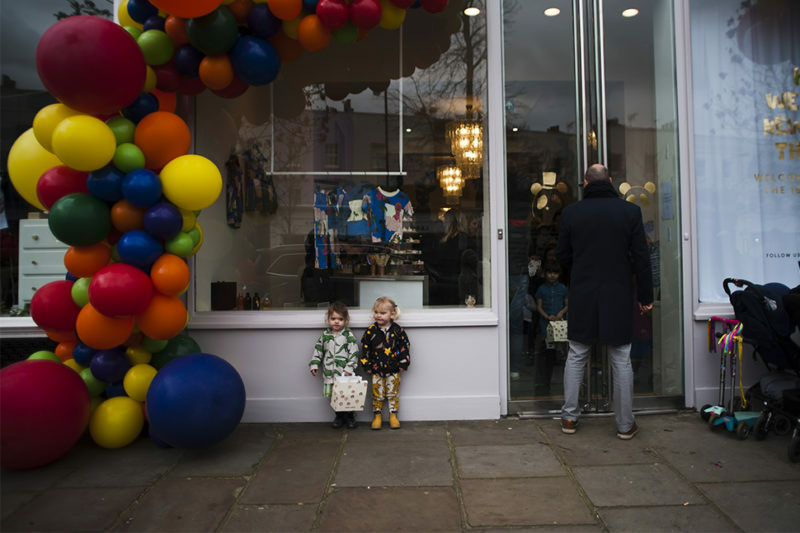 We’ve been fans of the brand since the boys were tiny and when we are able to justify splurging on higher-end clothing, Mini Rodini is one of the first places we look, so it was so exciting to me to learn that they were opening a store in Westbourne Grove, Notting Hill. Somebody on insta asked me how we get invited to launch parties. 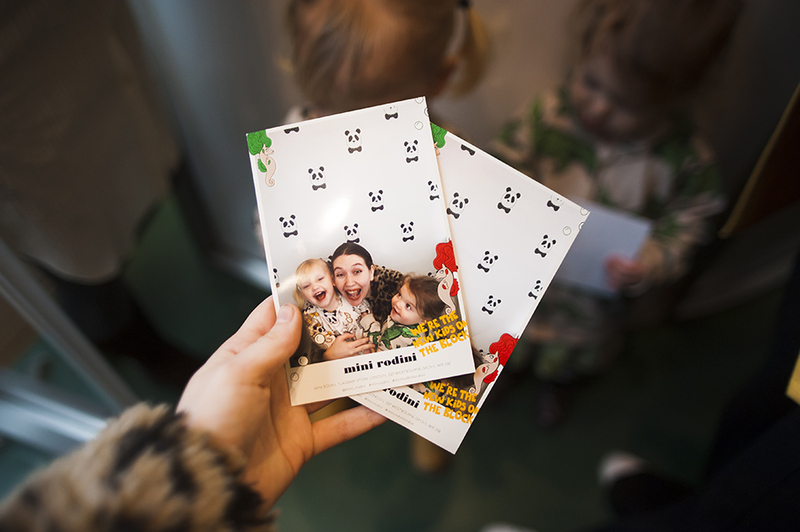 We do sometimes get invitations to exclusive events – and inevitably nine times out of ten they happen to be during the working week and we can’t go – but the Mini Rodini party was not exclusive and anyone could go. We haven’t been asked to write about it by the brand, but I’ve had more than a few requests to share pictures and so here they were. 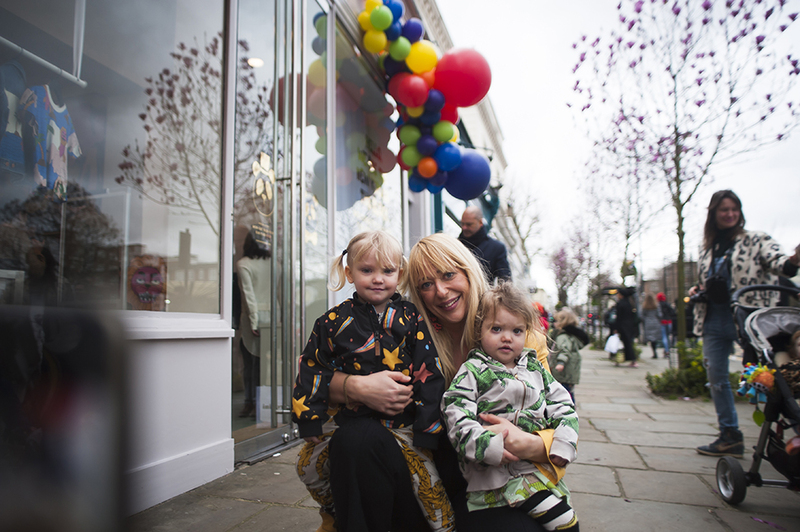 We actually didn’t take many inside the store as it was so busy and I had two little hands to hold! 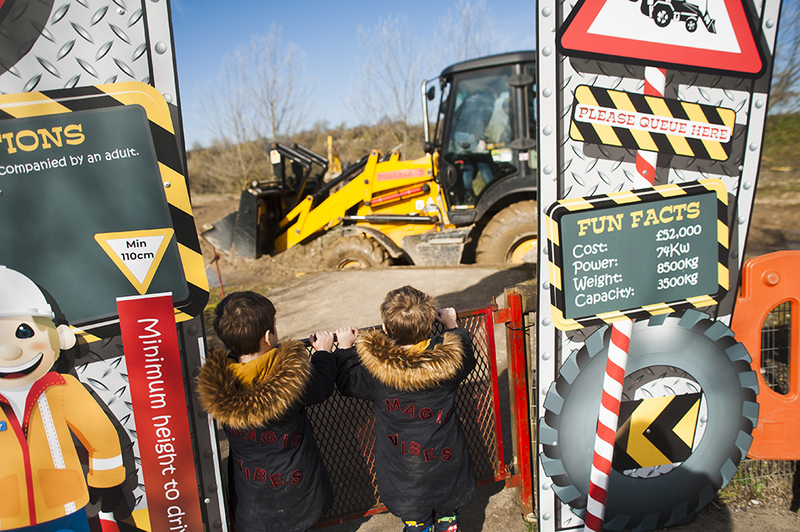 As with all good events, there was plenty of entertainment for the little ones. My two found it a bit overwhelming in the store and didn’t want to play the fishing game, but they were given a prize nonetheless – you can see one of the ‘goody bags’ in the picture above. 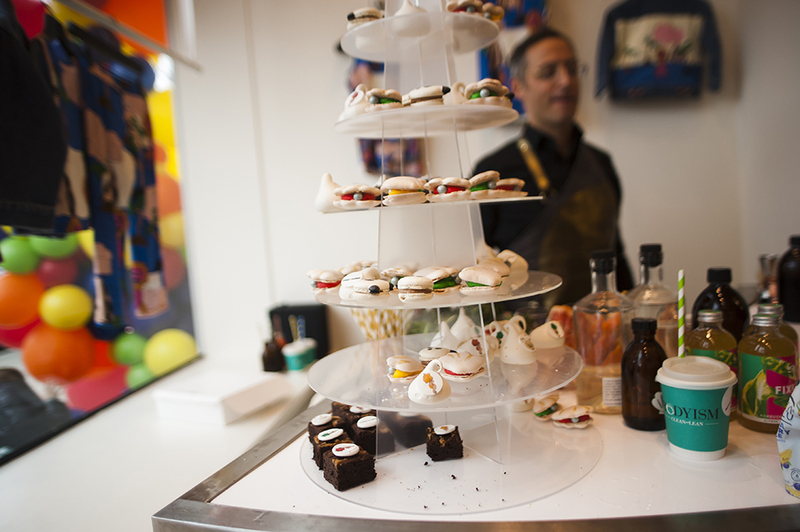 They contained vegetarian sweeties, with which the girls were delighted. Olympia, who is extremely ‘two’, threw a ginormous strop in the store when I refused to allow her to gobble them up one after the other like a packet of crisps. Sidenote: she now refers to ‘sweeties’ as ‘parties’, which I think is probably the most adorable thing ever. We enjoyed the photo booth tremendously and had two goes, and then the girls ate a chocolate brownie followed by the most adorable macaron designed to look like a panda. 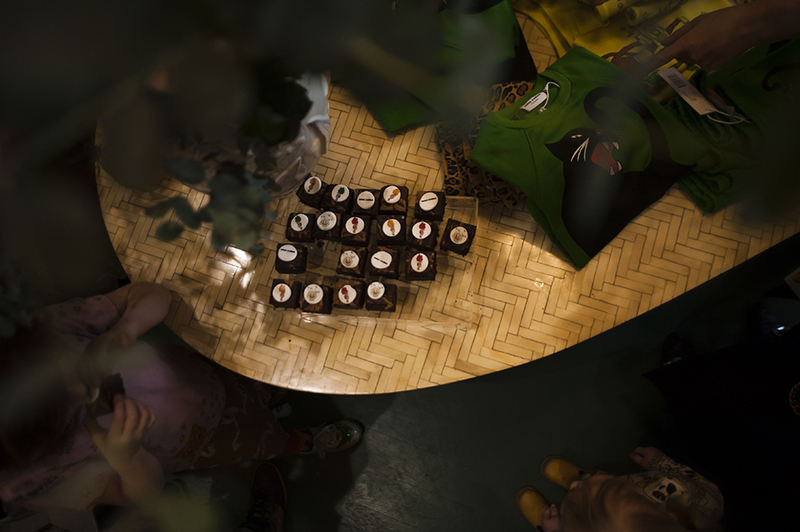 The brownies were illustrated with designs from the SS19 release, which ties in with what I love most about Mini Rodini – the intricacy of their designs. They looked delicious, but I was so busy photographing their snack that I neglected to eat either and have been kicking myself ever since…! 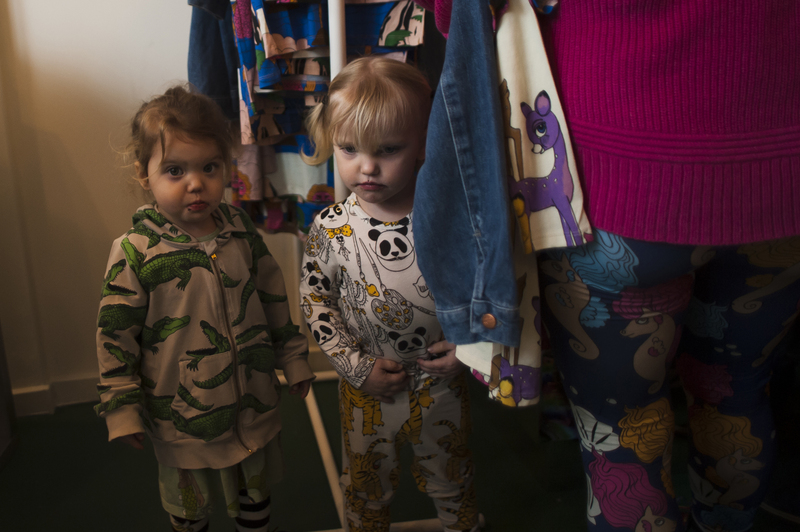 In the photo above, Olympia and Embla are enjoying a cuddle with Cassandra Rhodin, who founded the brand. She was charmingly tolerant of my fangirling. 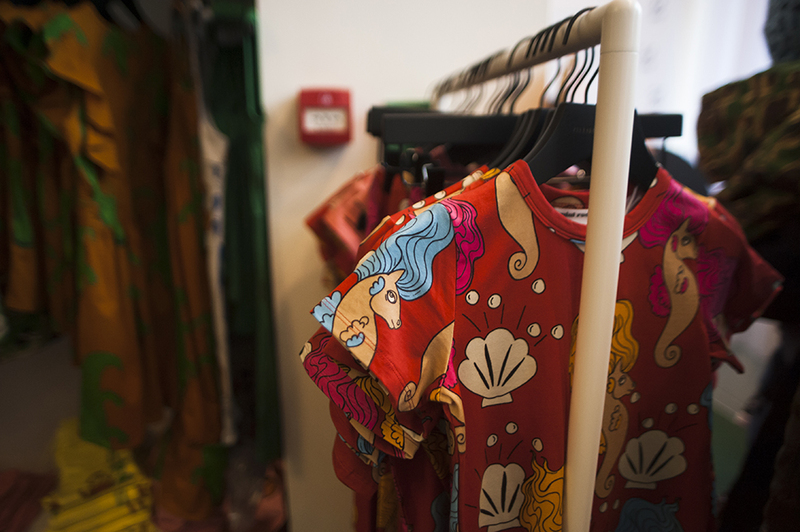 The most exciting part of the store is right at the back – the ‘treasures’ section, where you can find older prints that have been pulled out of the ether, recycled or repaired and magically transformed into something new. For print aficionados, I can report that there were: dinos (we were too late for these), Memory Lane pandas and bengal bedding, amongst other little pieces of joy and excitement. I could have spent drastically longer in this part of the store but the girls were restless and feeling rather squashed amongst the eager crowd. 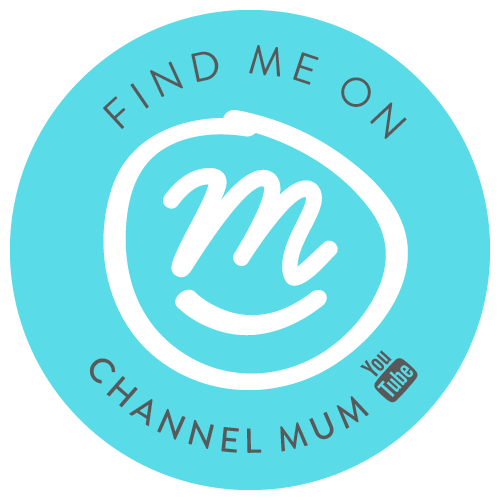 Without a doubt I shall be making my way back to the store in the coming weeks, sans children, to explore further! 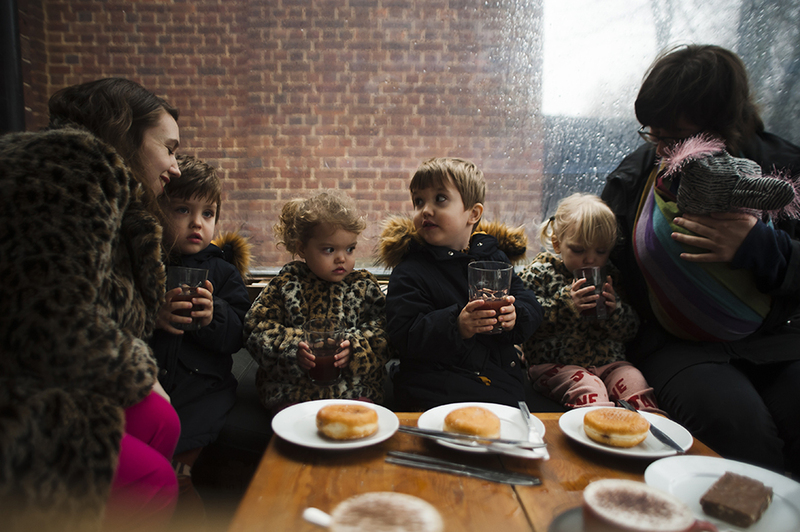 Following a jolly hour of investigating the store, we retired to brunch with Izzy Pugh and her charming family. It’s always a little surreal to hang out with people you ‘know’ from the internet and doubly so when, as in the case of Izzy’s children, they don’t ‘know’ you at all – but we enjoyed a delightful brunch and it was such fun to hang out and catch up on our mutual interests, albeit with the usual interruptions that one becomes rather resigned to when wrangling small children. Of my own two, Embla sat primly on my lap, declared “I’m eating a leaf” and proceeded to devour every watercress leaf from my avocado toast. Olympia insisted on removing her shoes and then rubbed a slice of toast down Izzy’s face as she sat feeding her baby. I know which one I’ll be bringing to civilised events going forward! Did you go..? It was fun to meet some of you there. I’m so very sorry about the house my darling. A better one will turn up and then you will be thankful (hopefully). Hi Rosie! Thank you for your comment. I should think it’s fairly obvious that most people don’t saunter about in real cheetah or leopard so I hope that you’re not genuinely concerned that we’re wearing real fur. It’s definitely not! Much like eating fake ‘meat’ (Quorn products or similar) we don’t have a problem with wearing fake fur. In fact, I think it’s a positive thing to demonstrate that people can get all of the enjoyment from wearing beautiful things in a way that doesn’t harm animals at all. I’d be interested to hear your thoughts though? No, I didn’t think you were dressed in actual cheetah or leopard. However, I do think the wearing of faux fur normalises fur wearing and encourages fashion for real furs… which is a bad thing. I’m inclined to think the opposite – that if cruelty-free versions of popular products are accessible, high-quality and normalised, people who would ordinarily eat the chicken or ice cream might try the Quorn nuggets or the dairy-free Cornetto and realise it’s possible to enjoy most of their favourite products without harming other creatures. I think the concept of wearing fur these days is too demonised for it to be possible to normalise it anyway, but perhaps somebody who might ordinarily wear real fur might consider an alternative.